Our kitchen cupboards are always full of different kinds of packets, bags, jars and containers. No matter how many cupboards I have, I always succeed in filling them with all sorts of ingredients and cooking equipment. Even though those messy cupboards and all the stuff that accidentally flies across the kitchen annoys me every now and then, I like the fact that I always have plenty of ingredients at home. Eating healthy and cooking wholesome food is so much easier when you’ve got good ingerients at hand. When I was diagnosed with celiac disease three and a half years ago, my way of eating changed. I had tried eating a gluten free diet already before the diagnosis and gluten-free grains were familiar to me, but still learning this new strict way of eating was a project of its own. Now I’m so used to eating gluten free that it doesn’t take extra energy or time in my everyday life, but when I travel and eat out I always have to pay a bit more attention. I love eating out and traveling every now and then but sometimes it can be a bit stressful when I have to check every order to ensure that it’s really gluten free. Luckily nowadays there are more and more options in restaurants and cafes but I still have a couple of things I always take with me when I’m away from home. When I travel or just stay with some friends or family, I usually bring some food with me. I might bring some gluten free crackers, granola or porridge flakes with me, so that I have some breakfast for myself. In addition to those things I almost always have some kind of a superfood sprinkle with me. 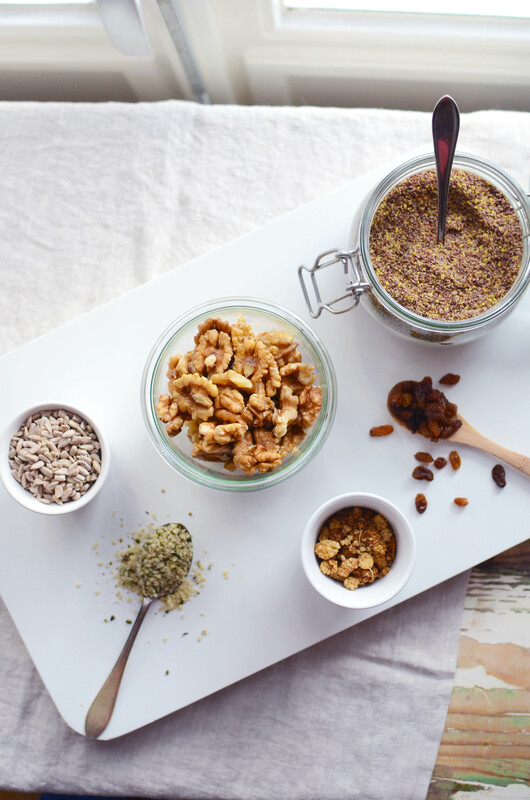 It can be a simple mix of ground flaxseed, hemp seeds, nuts and mulberries. Or it can be a bit more luxurios mix, like this one I’m sharing in this post. These sprinkles are super easy to make and really versatile to use, as you can sprinkle them for example on top of porridge, yogurt, smoothie, salad or ice cream. 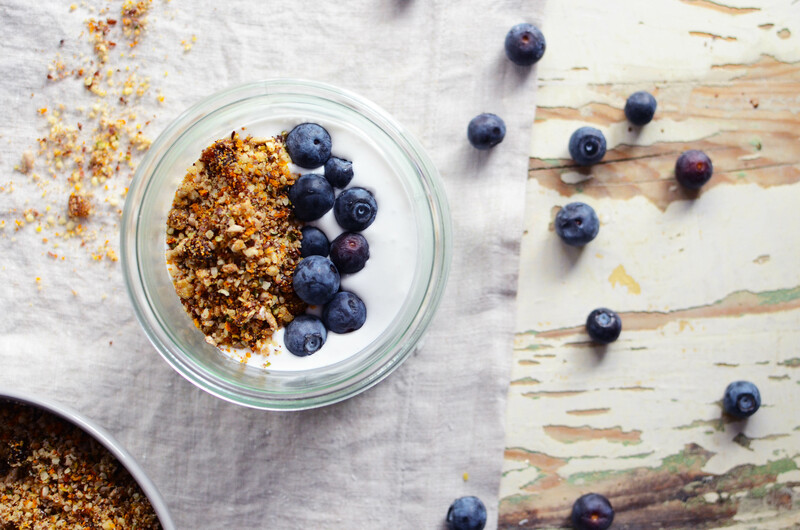 These superfood sprinkles have been my rescue when traveling and the only thing I could eat at a hotel breakfast was yogurt. If I’m doing a longer trip, I always bring some berry powders with me too. I’m quite fanatic in what it comes to eating berries and that’s why I take them with me all over the world. Naturally, when we moved here in the Netherlands I packed some berry powers with me. You can get berries here of course but I just love our northern berries so much and especially my favorites: bilberries, lingonberries and sea buckthorns. I haven’t seen any berry powders in the stores here, but luckily you can order the online now! Arctic Power Berries is a rather new company and they deliver these awesome berry powers almost worldwide. They were kind enough to treat me with their blueberry and sea buckthorn powder and with a hand in my heart, I can honestly tell you that these are the best tasting berry powders I’ve ever tried. So all you other berry fanatics out there, it’s now possible to have some northern berry power delivered to your door easily. I usually don’t have a specific recipe when making these sprinkles as they’re most often a mix of things that I find from my cupboards. Making a sprinkle is also my way of getting rid of those open bags and almost empty jars of different ingredients. Most often the base of the sprinkle is a mix of seeds, nuts and ground flaxseed and then I just add other things to make it more delicious. Hemp seeds, mulberries and berry powders are my favorites but shredded coconut, dried fruit and cacao nibs would work well too. You can also add a pinch of cinnamon, which brings a lovely flavor. 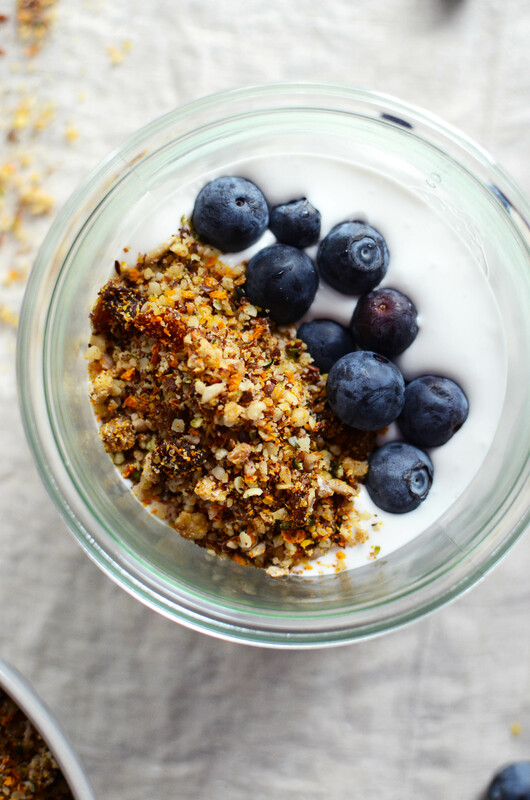 When you’ve got some sprinkle in your fridge, it’s easy to add it to your breakfast or snack, or take it with you to all kinds of travels. notes: you can buy pre-ground flaxseeds, nut it’s super easy to grind them yourself. just add the flax seeds into a blender and blend until they’re almost like flour. Put the sunflower seeds, walnuts and mulberries to a blender or a food processor and grind until everything’s in really small pieces. Pour the mixture into a bowl and add hemp seeds and ground flaxseed. Add other things as well if you like, such as berry powder and raisins. Sprinkle on top of porridge, yogurt, smoothie and ice cream. Store in a glass jar in the fridge.